A terrific new addition to the Koh Chang property market, this successful and long established resort is now available for immediate sale. Located in prime position in the middle of the west coast, the resort is located 100 metres back from the road in its own self contained and very private, tranquil area. It is within easy reach of restaurants, bars and shops. The local beach, perhaps Koh Chang’s most impressive, is also just a short walk away. The resort itself consists of 20 rooms in two styles of accommodation set around a swimming pool. A discreet 2 storey building houses 5 a/c rooms and 5 fan rooms, all with balconies, with each room ensuite with hot water shower and king sized beds. Around the 10 metre swimming pool, the central focus of the resort, you’ll find a further 8 a/c ensuite deluxe bungalows as well as 2 family bungalows, all sitting in nicely kept tropical gardens. The swimming pool itself is surrounded with full decking for sun loungers and has a splash shower. Flanking one side of the car park area, the on-site restaurant is open for breakfast, its kitchen at the rear of the property. The owner resides in their own separate accommodation of two 50sq metre rooms. All utilities (electricity, internet) are fully connected, with the water supply coming from the metred local source. Food, alcohol and hotel licences are all fully up to date. 4 staff are employed for the day to day running of the property. Well reviewed, the resort has its own social media pages and is already listed in the usual booking sites. At an annual rate in line with other similarly sized land rentals in this prestigious area, the current contract runs till 2020. The landlord is very open to negotiation on a new long lease going forward. This resort sale would suit an experienced resort owner as a new project building on the existing success and expanding the business. 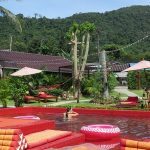 It would also be perfect for a first-time owner to start a new life in Koh Chang, with everything already in place and up and running – a perfect turnkey opportunity.